America’s Test Kitchen sends random episodes of their show to my email. The last one was for Beef Bourguignon. When I was thinking about what to make for Sunday, this seemed like a kind of dish that I had not made for a while. 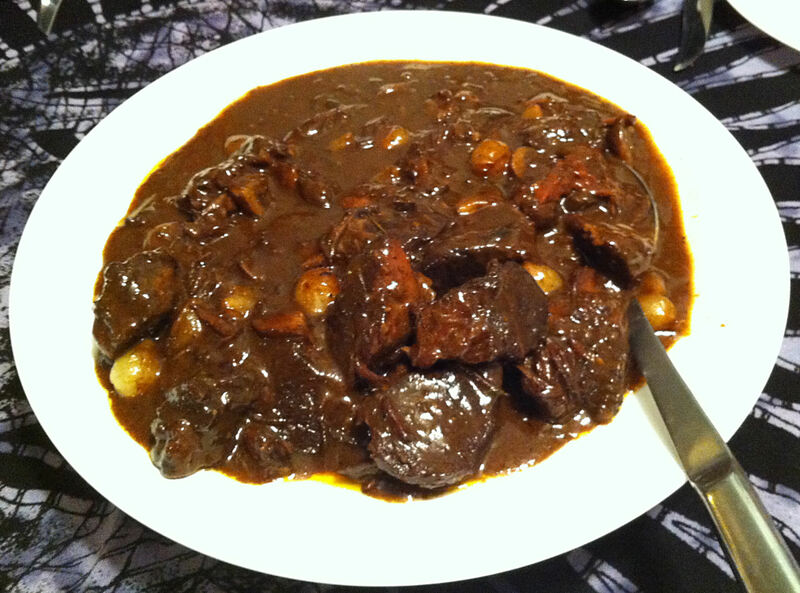 Beef Bourguignon is a French beef stew made famous—at least in America—by Julia Child. It was, in fact, featured on her very first show. While there are many recipes claiming to be Julia Child’s, most are adapted—some a lot—from the simple recipe she used in the video. I will be making some adaptations of my own. I am using the techniques of Julia Child and Test Kitchen, but sometimes in unexpected ways. For one thing, Julia’s recipe, and even the “simplified” Test Kitchen one, used several pots and pans. I get it down to just one pot. Julia recipe includes a beef stock—made by simmering beef, bones, and vegetables for hours and then discarding the solids. I find this very wasteful and I if I make a stock I puree the vegetables and return them to the stock. The Test Kitchen chef starts with canned broth, but then “boosts” it with the meat scraps—do not even get me started on the amount of meat left on her “scraps” which she eventually discards. I decided to compromise and used a canned beef stock. Note: To go with my beef stew I made herbed potatoes and broccoli soup. Julia also says you cannot serve this dish without a baguette. 1. Cut away the bones, any large bits of fat, and reserve them for later. Cut the meat into 2-inch chunks. 2. Sprinkle the beef chunks with the salt. 3. Mix one clove of crushed garlic with the soy sauce and sprinkle it over the meat. Tip: The soy sauce will boost the umami flavor, but there is not enough to make it taste like an Asian beef dish. 4. Mix the meat, so that all sides are coated with the marinade. 5. Put the meat in a sealable gallon bag. Press all of the air out of it and seal the bag. 6. Let the meat marinate for at least one hour. Tip: Overnight in the refrigerator is better. 7. Six hours before dinner, put the bone(s) and fat scraps in a wide Dutch oven and set it as close as possible to the broiler element in the oven. Note: I am using my large 8 quart Dutch oven because I want all of my meat to lay in a single layer. 8. Broil the scraps for 20 minutes. Tip: Turn the bits frequently to prevent them from burning. Note: You are trying to get a good browning on any meat and to render the lard from the fat. 9. Remove the scraps to a plate and add the mushrooms and onions. 10. Add a pinch of sugar and toss the vegetables in the beef lard. Tip: Depending on how much fat you had to render, you may need to add a tablespoon of butter to coat the vegetables. 11. Broil the vegetables for 20 minutes, tossing frequently. Note: Vegetables should be spotty brown when done. 12. Remove the Dutch oven to the stove top and transfer the vegetables to a bowl. 13. Add the remaining garlic, minced, to the pot with the tomato paste and sauté for two minutes over a medium heat, until the tomato has started to turn brown. 14. Add the beef stock, two cups of wine, the powdered mushrooms, gelatin, thyme and bay leaf to the pot. Tip: Put the dried wild mushrooms in a spice grinder and process them to a powder. If you have any particularly well browned scraps and bones you may add them to the pot and remove them before serving. Note: Both the tomato and mushrooms are to enhance the umami flavor. The packaged gelatin replaces long hours of simmering bones and cartilage to get the mouth feel of a good beef stew—I was going the use the word unctuous, but “they” talked me out of it. 15. Set the meat chunks into the broth in a single layer and bring the pot just to a boil. Tip: Ideally you want the meat halfway out of the broth. The meat will brown as it is exposed to the hot dry oven. Note: I had too much liquid in my pot and the chunks were completely submerges. I used a round wire rack to lift the meat up out of the sauce. As the liquid level drops from evaporation and the meat has browned, I will return the chunks to the sauce. 16. Transfer the pot, uncovered, back to the oven and set the temperature to 350º F.
17. Cook for 40 minutes and then turn the meat chunks over. Tip: You can smell when the beef exposed to the oven is well browned, if it is not give the chunks another 10 minutes before turning the meat. 18. Brown the second side of the meat for 30 minutes, until well browned. Note: When the second side was well browned I removed the wire rack. 19. Put the lid in the pot and continue cooking for 2-3 more hours. 20. Use a slotted spoon to transfer the meat to a bowl. Note: Remove any bones, scraps, and the bay leaf from the sauce. If there are any meaty bits in the fat scraps separate them and return them to the pot. 21. Add the rest of the wine, the pepper and bring the pot to a simmer. 22. Mix the softened butter and flour together into a paste. 23. Whisk the flour paste into the sauce and simmer until it has thickened. 24. Return the meat, mushrooms and onions to the pot and gently toss to coat. Tip: Be careful handling the meat chunks and onions, because they are very well cooked and will easily turn to mush if they are treated roughly. 25 . Simmer the stew for 3-4 more minutes on a very low heat to meld the flavors. Tip: You may also stop at this point and let the stew cool completely before covering it, to reheat and serve the next day.